FREE 3 years legal expense cover! Part Exchange VERY Welcome, HPI Clear, All Bikes Come With Full Warranty & PDI, Carefully Prepared By Time Served Experts, With A Stonking V - Twin Motor These Are Brilliant! I love the Way They Ride, The Handling Gives Loads Of Confidence & They Have A Great Spec Too! Awesome Bikes! This Lovely Example Has SW Motech Alloy Bash Plate & Engine Bars, Hugger, R&G Radiator Grille, Panniers, Heated Grips, Hand Guards & An Alarm! Nationwide Delivery From £120 + VAT, High Resolution Images On Request, Low Rate Finance From £0 Deposit. 60 Day Payment Holiday On Std HP Deals With Moto Novo. Typical PCP Example £1199 Deposit, Then 36 x £91.69 Followed By Final Payment Of £3345 Or Trade In - Or As This Is A GUARANTEED FUTURE VALUE Simply Return The Bike! Total Payable £7844.84 Inc. Deposit, Flat Rate 5.5 % APR 13.5 % Representative, Contract Mileage is 4000 a year Excess Mileage Fee Of 8p Per mile May Apply. From street bikes and cruisers to scooters and full-blooded sports bikes, Suzuki has a model to suit every rider. 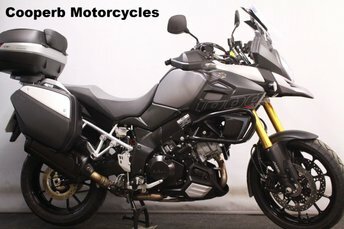 Come to Cooperb Motorcycles Ltd today and discover our outstanding range of pre-owned Suzuki bikes _ quality examples designed to suit every budget. Whether you're looking for your first bike or have clocked up plenty of miles in leathers, we'll help you find the perfect model to suit your needs. You can browse our complete range of used Suzuki motorcycles for sale in Northampton here on the website, before arranging to test ride the bike of your choice. Our knowledgeable and friendly team will be on hand to offer advice and guidance when it's required, and you can be sure we'll do everything possible to help you find the right Suzuki motorbike to fit your requirements.